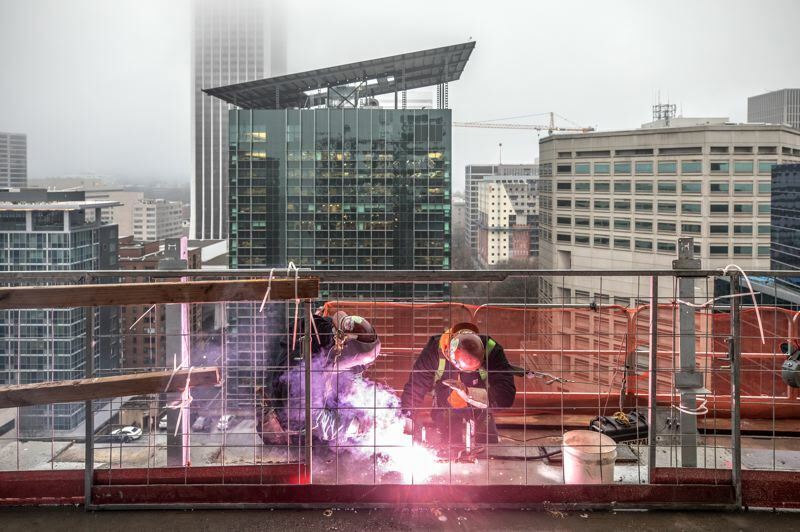 One month after topping out, the new Multnomah County Courthouse is taking shape inside and out. 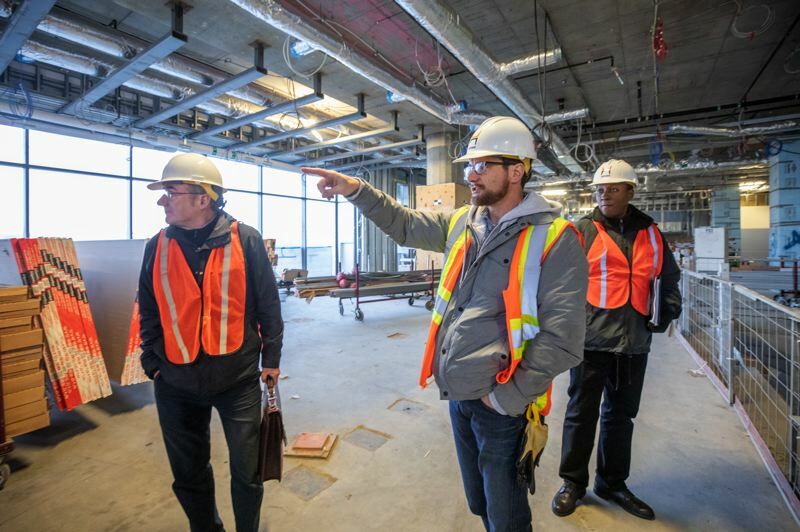 In the five years since he joined Multnomah County as a senior project manager, JD Deschamps has spent more than a little of time convincing people that a new, state-of-the-art central courthouse really is on the way. The widespread disbelief has been understandable. Efforts to replace the current courthouse, a structurally unsound building at Southwest Fourth Avenue and Southwest Main Street, had been under way for several decades with little progress until 2015, when county officials finally settled on a parcel of land at west end of the Hawthorne Bridge. But even as the project began to move forward and the structure began to rise, some people still needed more convincing — including one courthouse worker who informed Deschamps there was only one way she would believe she would one day be working in a new building. 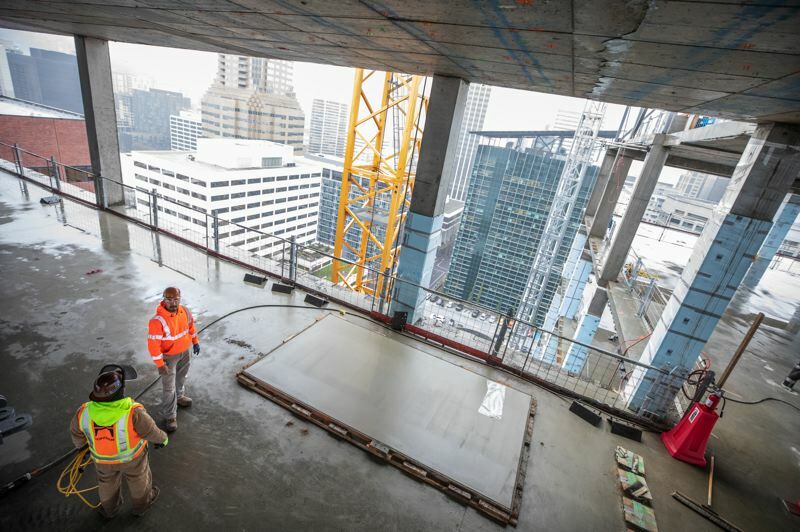 I'll believe it when I see them pour [concrete for] my floor," the employee told Deschamps. 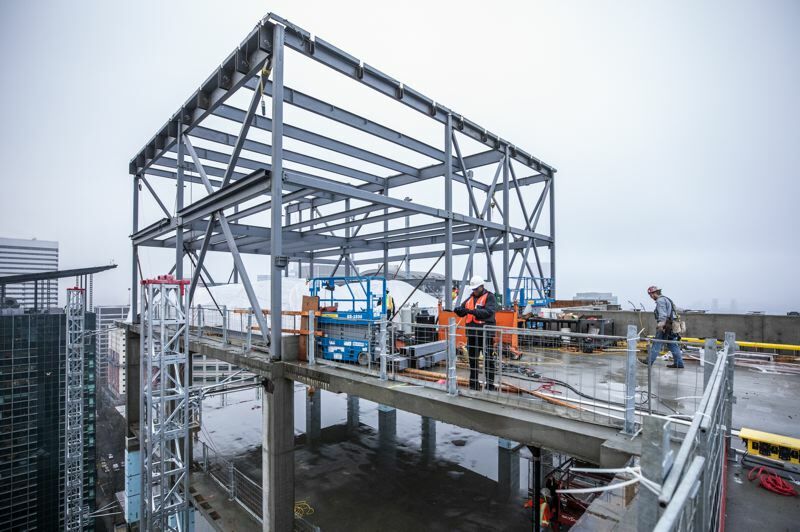 The courthouse project reached a milestone in November when the county held a topping out ceremony, celebrating completion of the vertical rise of the building. The $324.5 million project, which includes $246.4 million for construction costs and a $13.5 million continency fund, is being paid for with county and state money. While the building is 17 stories tall, higher than usual floor-to-floor heights give the building a rise more in line with a 22-story structure, according to the project team. The rooftop of the building, which offers a bird's-eye view of the Hawthorne Bridge, will feature mechanical systems and a photovoltaic panel array. Energy generated by the solar panels will be used to power the bridge lifts and lighting. Meanwhile, spaces inside the courthouse building are taking definite shape, offering glimpses of what will eventually be in place. In the main grand lobby, which will be accessed through an entrance on the corner of Southwest First and Southwest Madison Street, concrete columns rise 60 feet to meet the ceiling. Their surfaces feature a simulated wood grain. "It's quite an achievement to do concrete work of that quality," Multnomah County spokesman Mike Pullen said. On other floors, still-empty wells identify where elevators will be located. Unlike the current courthouse, the new facility will have separate elevator systems for judges and their staff and for the public. A third system will be used to transport defendants to holding cells and courtrooms from a sally port area. The sally port, a garage-like area that will allow law enforcement vehicles to securely deliver defendants from jail facilities to the courthouse, is a unique feature to the new courthouse. The current courthouse facility lacks a secure entrance separate from public spaces. Instead, a street by the building must be shut down twice a day to allow law enforcement officers to move defendants in and out of the building, disrupting vehicular traffic and light-rail trains. 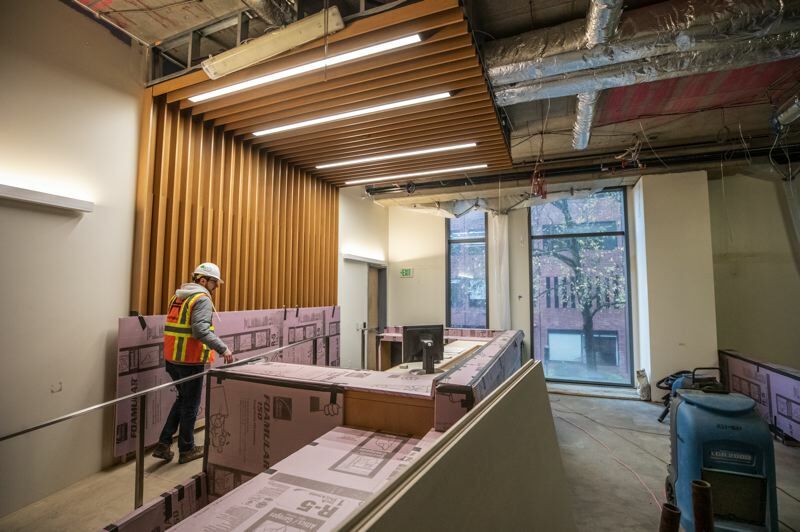 The layout and design details of the Central Courthouse building are the result of an architectural team with strong experience in justice facilities as well numerous conversations and meetings with law enforcement agencies, including the Multnomah County Sheriff's Department. A unique feature of the courtrooms came about from similar conversations and meetings with judges. All main courtrooms will feature upper transom windows that will provide natural light and provide a sense of the passage of time. "That came up in a meeting with judges and was one of the goals of the architects as well," Deschamps said. Designers even conducted tests to determine the exact placement of the windows to avoid causing glare or interference from direct sun. The architects weren't the only members of the project team that set up situations to ensure that details of the project were ideal. Hoffman Construction, the general contractor-construction manager, created full-size, off-site mock ups of major parts of the building, from the sally port area to courtrooms, Justin Paterson, the company's project manager, said. Another unique aspect of the courthouse project becomes apparent to those who visit the project site. On every floor, there's a higher number of women and minority apprentices and journeymen than usually found on an average construction project. It's an accomplishment that the county and the project team say is a focused and ongoing effort. While public projects will often identify a certain percentage of hours to be worked by apprentices, that goal has been taken further in the courthouse project, with breakout goals for male and female apprentices by trade. "Each trade stepped up and agreed they would help the project meet its goal by trade, not overall," Lee Fleming, the county's supplier diversity officer, said. For males, that goal is 20 percent per trade for both apprentices and journeymen. For female apprentices, the goal is 25 by trade for women. However, at the journeyman level, where women have in the past been underrepresented, the goal for women is six percent across the board. "That's recognizing the inherent challenges women have in the construction industry being supported," Fleming said. Like other cities across the country, the Portland metro area is suffering from a shortage of skilled workers. In order to avoid having shortages cause delays on courthouse project, Hoffman brought subcontractors onto the project earlier than normal, even including them in scheduling efforts. "They've known for a long time when they were going to need workers ... a lot of them were able to plan their workforce needs ahead of time," Paterson said. Making sure there were enough workers for the project was only part of the inclusion and diversity goals on the project, though. The county also set a goal to award 20 percent of project construction dollars to state-registered COBID firms, a designation for women- and minority-owned, emerging small businesses and service-disabled veteran-owned companies. 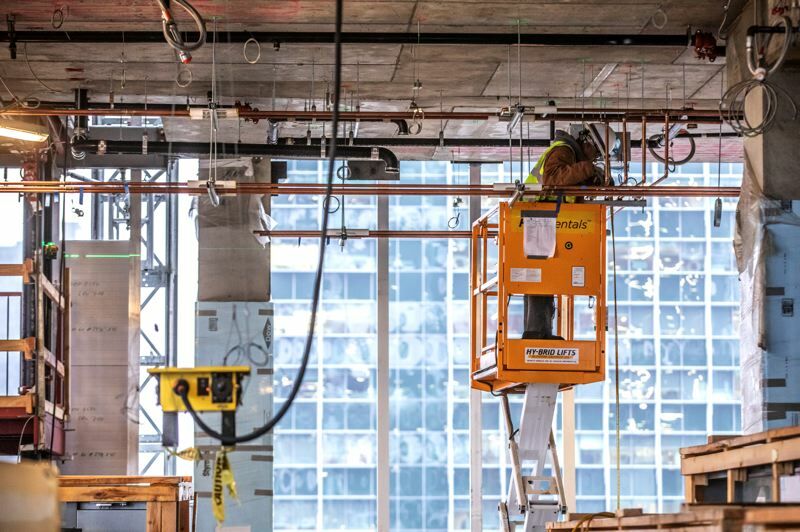 Efforts to hit that goal started even before construction began, with as many as 12 different efforts to connect with firms. Fleming also worked with Hoffman throughout the project when he has noticed numbers were running lower than the goal. If he knew of a COBID-certified firm that could do work in a certain area, for example, he would make a suggestion to Paterson and his team. "I'm really proud of the fact that when we saw challenges, maybe we didn't see enough representation from one area, we would make a recommendation and the team would do their best to make an adjustment," Fleming said. "We would recommend a firm they hadn't heard of and they would investigate and then bring them on board." One step the county has taken that others are taking notice of is a system to estimate how many COBID firms and apprentices will be coming onto the project in the future. Normally, those numbers for most projects come in 45 to 60 days after a company has started onsite work. For the courthouse project, though, Hoffman created a report that allows the team to track progress on what Fleming calls a "go-forward" basis. An online "diversity dashboard" is used to share those numbers with the general public. "On the dashboard on the website, we have a 'projected' screen," Fleming said. "It shows where we are now and where we expect to be. That [latter] number has always been hidden. The data that is being collected and tracked on the dashboard will likely prove useful even after the courthouse is completed. The numbers aren't just showing the project is ahead of diversity goals, including more than 28.3 percent of project dollars contracted to COBID firms and 28.2 percent minority male apprentice apprenticeship participation as of September. They also show areas where recruitment can be improved. While white women make up 96 percent of all female workforce ethnicity on the project, for example, African American women make up less than 1 percent as do Hispanic women. "I think when we get through with this project, it's going to be a great study piece," Fleming said. Although there's still work to be done before the Central Courthouse project is finished, the county and the project team say they're on target to continue to hit goals, both for workforce numbers and schedule targets. Last year, the project was in a holiday moratorium area that limited street closures so as to minimize the impact on holiday shopping. This year, however, the project is outside that area, which has allowed work to continue moving along. Deschamps even has been able to convince that last courthouse worker waiting for her floor to be poured that a new courthouse will be finished and ready for business in 2020. "Once we poured her floor," Deschamps said, "I took a photo and said, 'We're good. It's happening now.'" The courthouse project isn't just about new construction. An existing historic building on the corner of Southwest First and Jefferson called Jefferson Station will be incorporated into the project. Originally built in 1909 as an electrical substation, two exterior walls of the building are being retained while the interior has been gutted for renovation. When completed, the 22,173-square-foot Jefferson Station will include courtrooms for high-volume proceedings such as traffic and small claims courts, a drop-in daycare center for children whose parents need to do business in the courthouse, bike and shower facilities, and offices. While most people consider the Jefferson Station renovation to be a secondary project to the tower, the city took a different viewpoint. 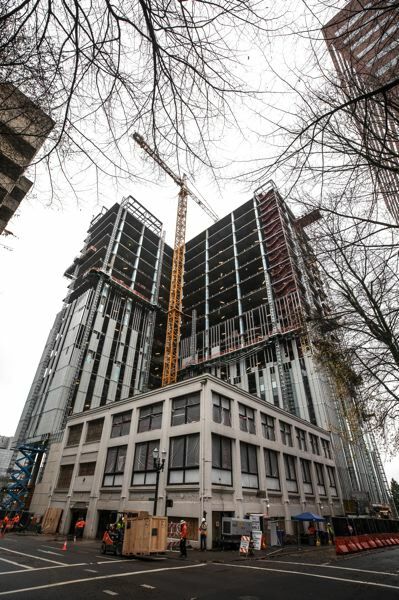 The project team expected the project would require two reviews from the city — one for design of the tower with the Portland Design Commission and one for Jefferson Station with the city's Historic Landmarks Commission. But in the end, the city told the team the project only had to pass through one review. "The city decided that the tower, at [464,712 square feet], is an addition to Jefferson Station, so we only went through the Historic Landmarks Commission," Deschamps said.